Will HP Raise Its Dividend in 2019? A dividend boost is likely, but you'll have to wait a while. Check out the latest HP earnings call transcript. HP (NYSE:HPQ) isn't the sexiest tech stock on the planet. After all, it sells PCs and printers -- certainly not the kinds of products that excite growth-hungry investors. However, the company is a leading player in its market and, as such, manages to generate a significant amount of free cash flow. A large chunk of that free cash flow makes it into the pockets of HP's shareholders through a robust capital return program that includes both dividends and share repurchases. If you're an HP shareholder, then I think the odds are pretty good that the fairly large dividend -- the stock currently offers a dividend yield just north of 3% -- is one of the things that attracted you to the stock. Not only is the size of the dividend today something that's attractive, but I'd imagine that the promise of continued dividend increases over time is a key consideration, too. To that end, it's worth asking -- and answering -- the following question: Will HP raise its dividend in 2019? I think the answer to that is "yes." Here's why. The Hewlett-Packard Company split into two companies back in 2015, giving us HP and Hewlett Packard Enterprise (NYSE:HPE). Since it was formed, HP has boosted its dividend every four quarters without fail. I realize that's a fairly short track record, but if it helps, before the Hewlett-Packard Company split into two, it also delivered consistent annual dividend increases to its shareholders. The fact that HP has done a good job of giving its shareholders annual raises should be a good sign that the company's management and its board of directors is committed to boosting the dividend each year. Intent is there, but is capability? Although it's clear that HP intends to boost its dividend each year, intent isn't worth much without the ability to act on it. Fortunately, an examination of the company's current financial situation, coupled with what analysts currently expect the company's financial performance to look like over the next year, tells us what we need to know: HP can easily support a dividend boost in 2019. Over the last 12 months, HP generated $2.44 per share in free cash flow. The company's current quarterly dividend payment is $0.16 per share, which, on an annualized basis, translates into $0.64 per share. This means that the company's trailing-12-month free cash flow is more than enough to cover this annual dividend multiple times over. So, unless HP's business completely falls apart in fiscal 2019 -- something that doesn't seem likely -- the company should be more than capable of giving its investors a sizable dividend boost this year. 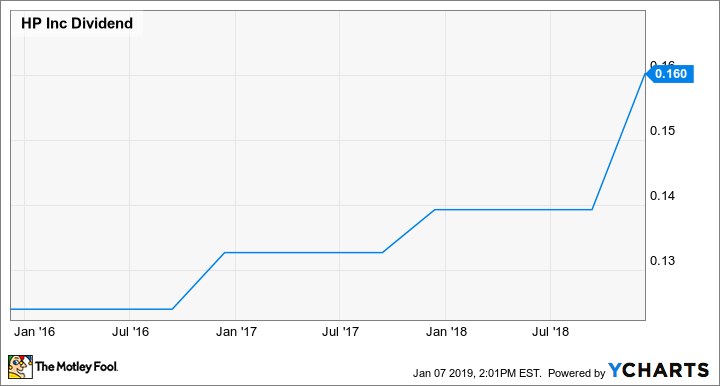 Now, keep in mind that HP just raised its dividend back in December, so investors should expect the company to continue to pay a $0.16-per-share dividend for another three quarters. However, if all goes as planned, investors should see a dividend bump at the end of the year.